Elegant Findings Antiques has an extensive selection of Meissen dinnerware which includes Meissen blue onion dinnerware, as well as Meissen purple Indian, Meissen streublumen, Meissen Chinese butterfly and Meissen dinnerware with large bouquets of flowers and bugs. 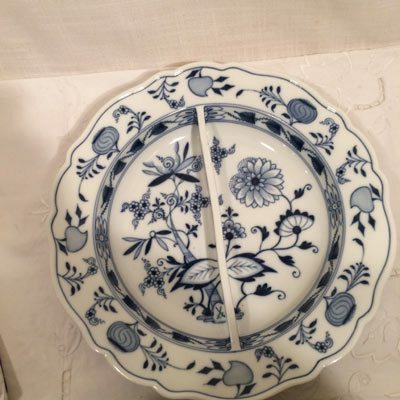 We choose each piece of Meissen dinnerware for its beauty, condition and rarity. 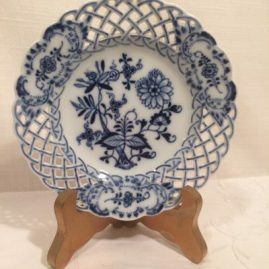 At Elegant Findings Antiques, you will be able to find rare pieces of antique Meissen dinnerware that you can not find anywhere else. 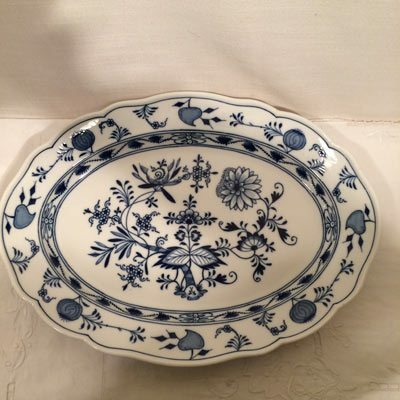 Meissen blue onion dinnerware has been popular for the past 300 years. 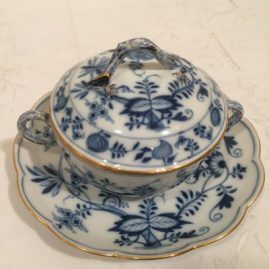 Please look at my blog on The History of Meissen Blue Onion Porcelain for much more information. 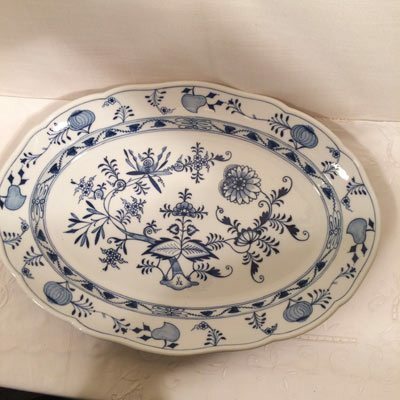 On this page, you will see a wonderful and rare selection of Meissen blue onion dinnerware that Elegant Findings has. If you look at Page 12, Meissen blue onion porcelain, you will see an even larger selection. 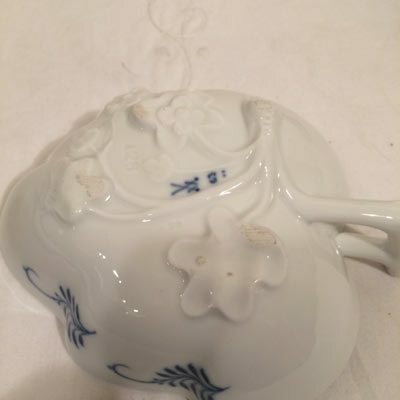 I would like to discuss some of the rare Meissen blue onion pieces we offer on this page. We have a set of twelve Meissen pots de cremes with handles and a gilded border and another set of eleven handled Meissen pots de cremes without a gilded border. These are very rare, as in the past thirty years, I have only seen and had five of these handled pots de cremes. These would make an elegant addition to any table setting. 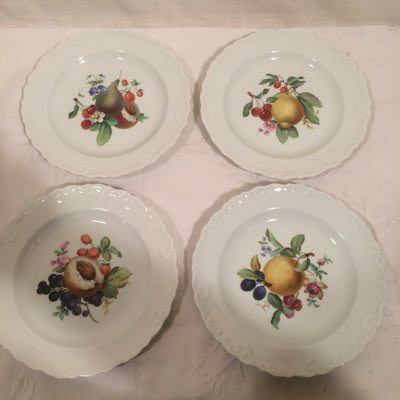 We have a rare set of 11 Meissen reticulated appetizer plates, as well as a set of reticulated Meissen dessert or luncheon plates. The leaf bowls that we offer are also very special. They are even decorated on the bottoms of the bowls with raised flowers and vines. 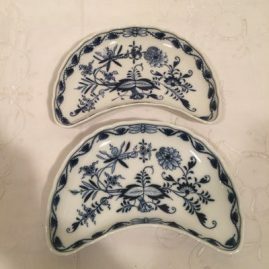 You will also see a rare set of large crescent shaped dishes. These were originally considered bone dishes. However, because of their large size, they can be used for bread or rolls or for salad plates. 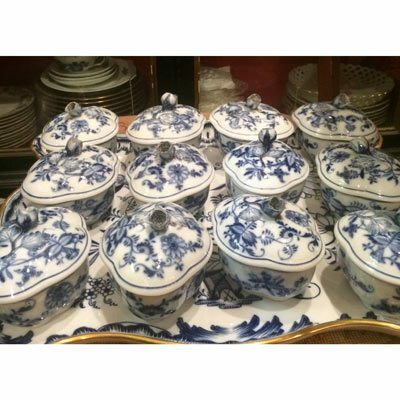 We also offer you a set of covered bowls with flowers on top to keep your delicious gourmet selection warm while you serve it. 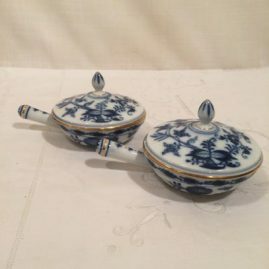 It is very unusual to find double egg cups, but we have some of these for your special breakfast or brunch. 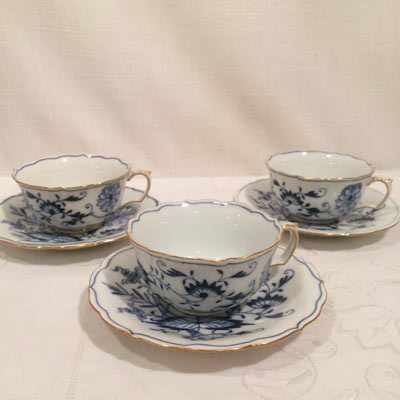 For your elegant high teas, we have a set of 20 gilded cups and saucers also in the Meissen blue onion pattern. 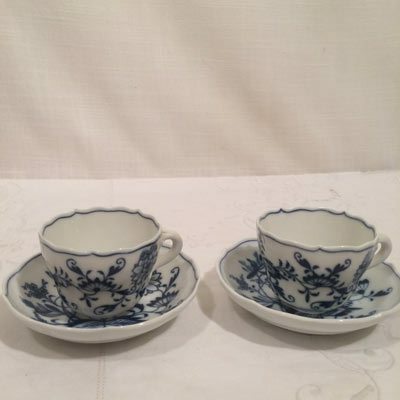 If you love hot chocolate or espresso coffee, we offer you a set of demitasse cups and saucers. 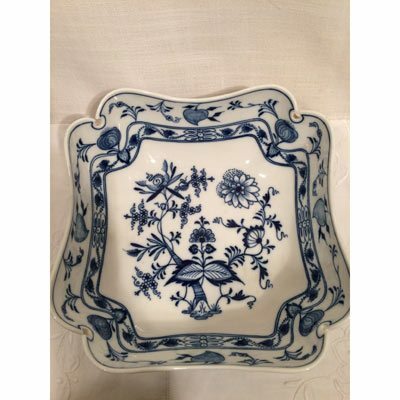 In addition, we have many square serving bowls and platters on which to serve your fabulous dinners. 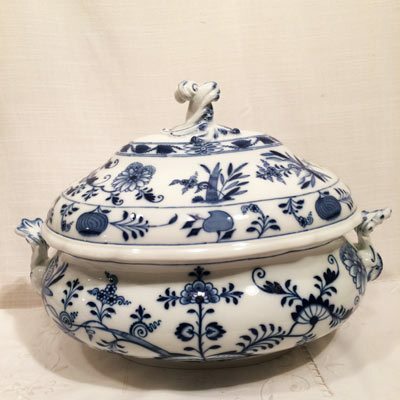 Last but not least, we have the crowning glory of your table, a Meissen soup tureen. All of these Meissen blue onion pieces are signed with the crossed sword marks, and date from before 1890s to 1930. If you love Meissen blue onion like people have loved for three hundred years, you can choose any of these Meissen blue onion pieces for your own collection to make your table and meals more fabulous! 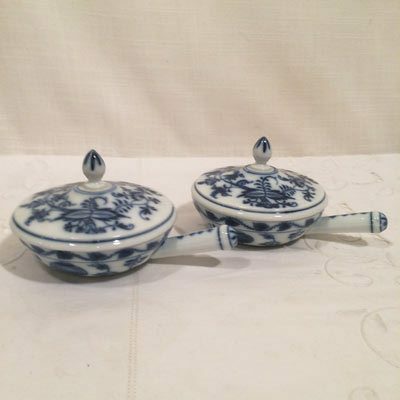 Set of 12 Meissen blue onion sauciers or pot de cremes. 6 inches long by 3 1/2 inches tall. Circa-1890s. Price on Request. Set of twelve Meissen blue onion reticulated appetizer plates. Diameter is 6 inches. Price on Request. 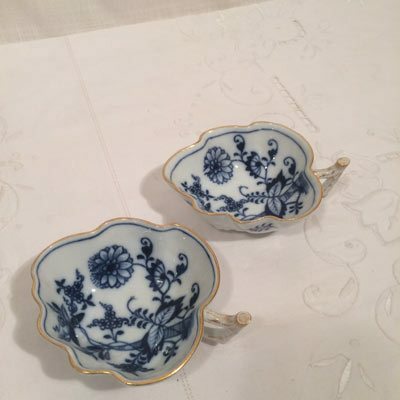 Eleven Meissen blue onion leaf bowls with gilded rim. Length-4 3/4 inches by 1 1/2 inches tall. Price on Request. 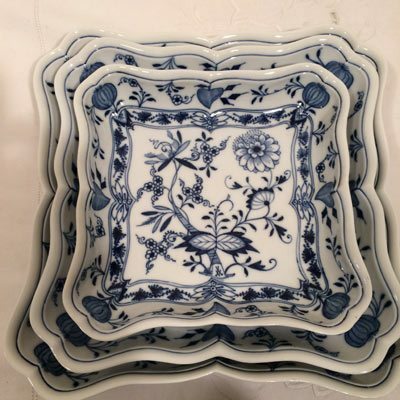 This is the interesting bottom of the Meissen blue onion leaf bowls. Prices on Request. Six unusual Meissen blue onion leaf bowls. Circa-1890s. Length-4 3/4 inches by 3 1/2 inches tall. Price on Request. Set of twelve Meissen blue onion large crescent shaped dishes. Circa-1923-1933. Eight inches wide by 5 inches tall. Price on Request. 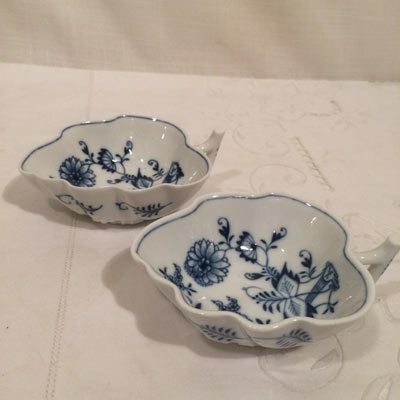 Set of twelve covered bowls with a flower on top. Circa-1890s. 5 inches wide by 4 1/2 inches tall. All flowers have some roughness on them. Price on Request. 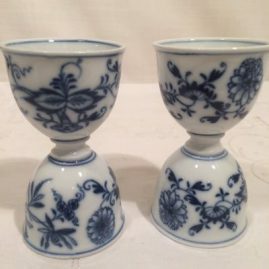 Seven rare Meissen blue onion double egg cups. Circa-1890s. Height-3 5/8. Prices on Request. 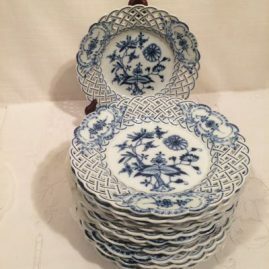 Set of twelve Meissen blue onion reticulated luncheons. Diameter-8 inches. Circa-1890s. Price on Request. Meissen blue onion ecruelle with matching under plate and gilded borders. Width-7 1/2 inches by 6 inches tall. Price on Request. Twelve Meissen blue onion demitasse cups and saucers. Price on Request. 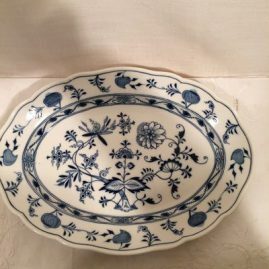 Meissen blue onion divider bowl. It has two compartments. Diameter-11 7/8 inches. Circa-1890s. Sold. 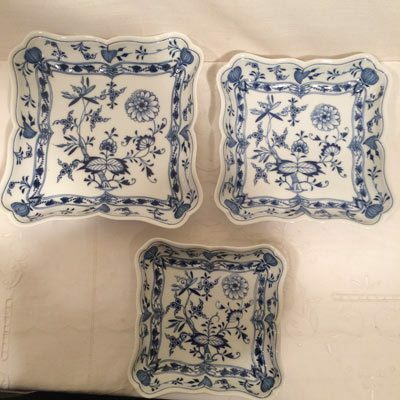 Three Meissen blue onion square bowls. Smallest bowl-8 1/2 inches, medium bowl-11 inches, largest bowl-12 inches. Circa-1890s. Price on Request. Meissen blue onion platter. Circa-1890s. 13 1/2 inches wide by 9 1/2 inches tall. Price on Request. Large Meissen blue onion platter. Circa-1890s. 18 3/4 inches wide by 13 1/2 inches tall. Price on Request. Meissen blue onion platter. 15 3/4 inches wide by 11 1/2 inches tall. Circa-1890s. Price on Request. Meissen dessert plates with fruit paintings, each plate painted with different fruits and each having raised shell borders. Circa-1870s. Diameter-7 1/4 inches. Sold. 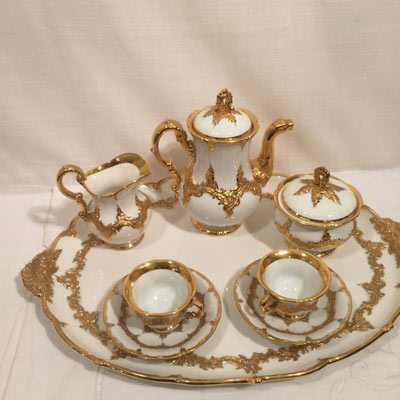 Beautiful Meissen white with heavy gold coffee set with tray. The set includes a coffee pot, covered sugar and creamer with two cups and saucers with a large tray. Length of tray-19 inches, depth of tray-13 1/2 inches. Circa-1880s. Sold.